The days are longer, warmer, brighter and just all around happier. Plus I love a good bomb pop from the freezer (and an ice cold margarita). It’s a bottle drying rack but I don’t like being told what to do so I display plates on mine. There’s nothing I like better than a buttered baguette but this bread box holds my dog’s treats. A couple of vintage Julia Child cookbooks are waiting patiently for me to whip up a pot of boeuf bourguignon. I’m loving the white on white so I filled up my open shelves with HomeGoods finds. Vintage thermoses and state glasses are ready for lemonade (with or without vodka). 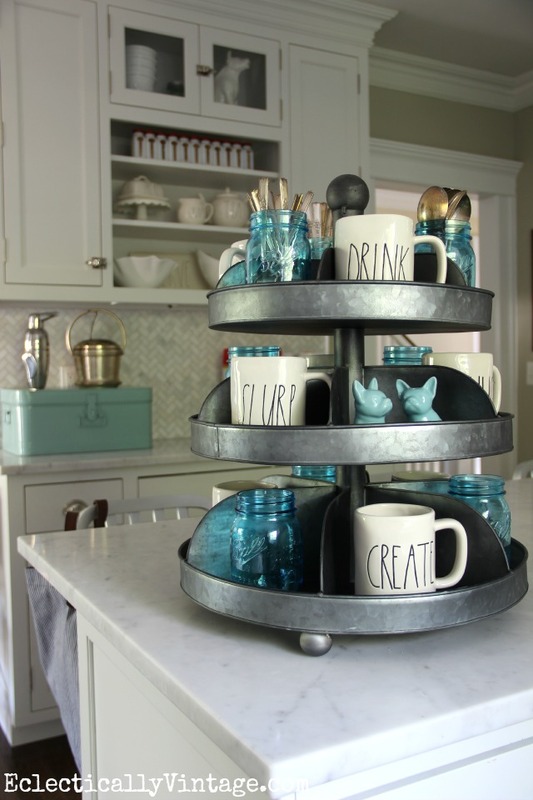 I went a little crazy with these cute mugs from HomeGoods in my favorite industrial tray. 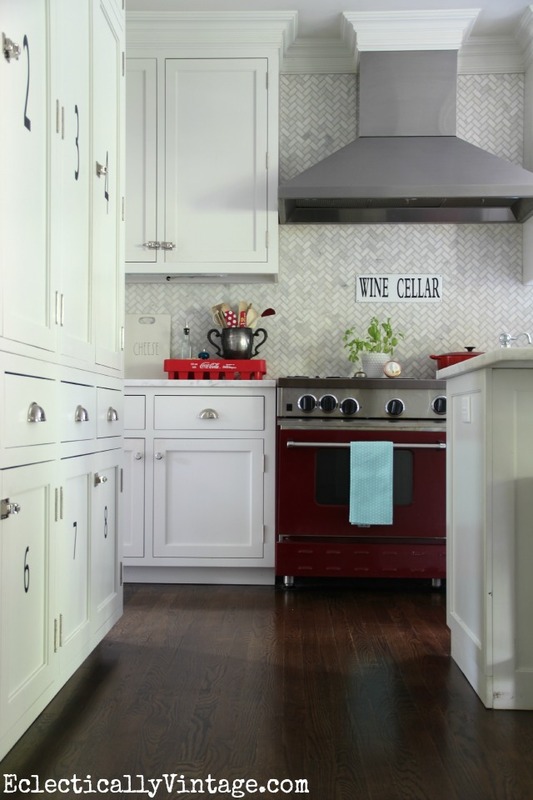 My favorite tip for making a kitchen look high end: bring tile up to the ceiling. 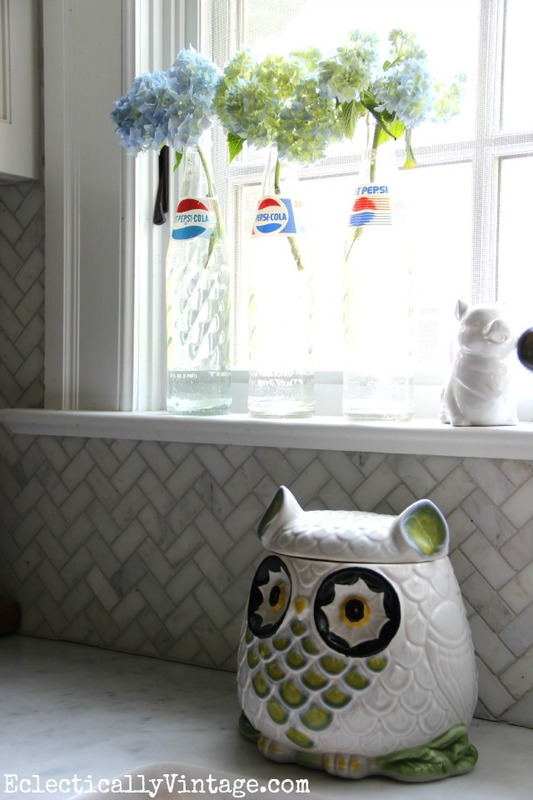 Can you believe I found my herringbone tile on ebay! The trophy goes to me for being a mediocre cook! If you’re going to cook, you might as well have fun utensils like these from HomeGoods. 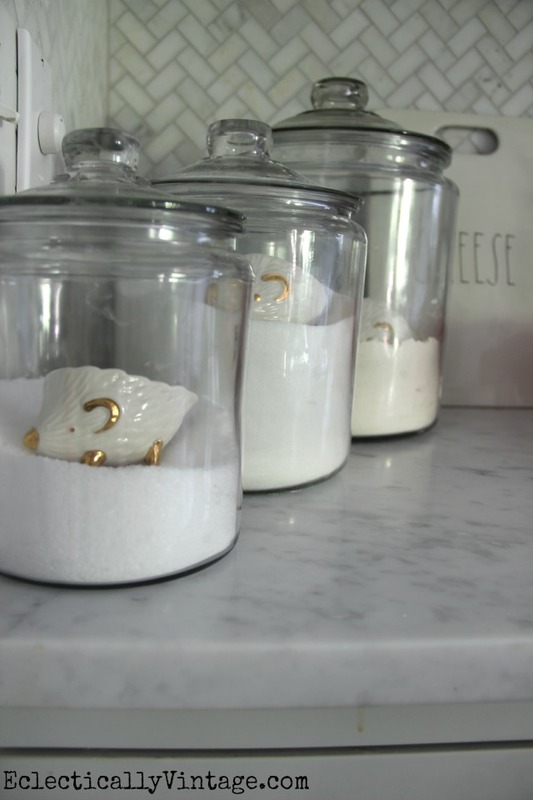 Every kitchen needs gold hedgehog measuring cups. 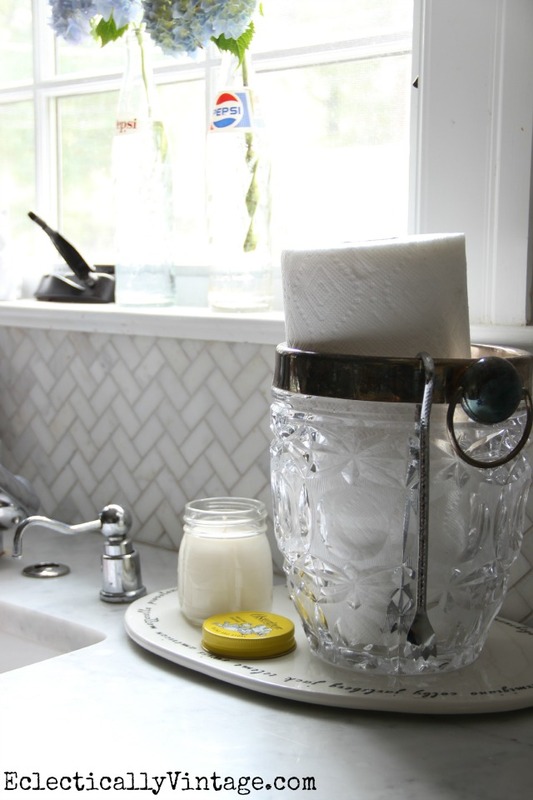 Doesn’t everyone store their paper towels in a vintage ice bucket? 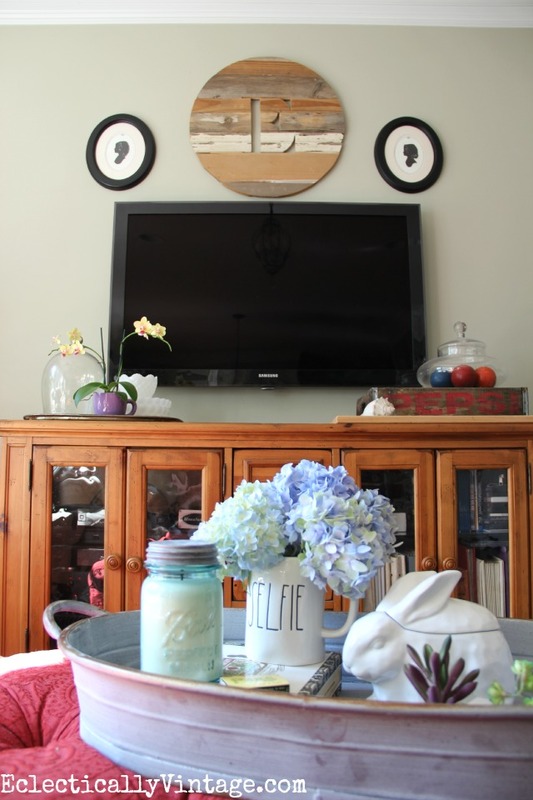 I searched high and low for the perfect thing to hang over my tv and finally found it in this custom made, reclaimed wood monogram. 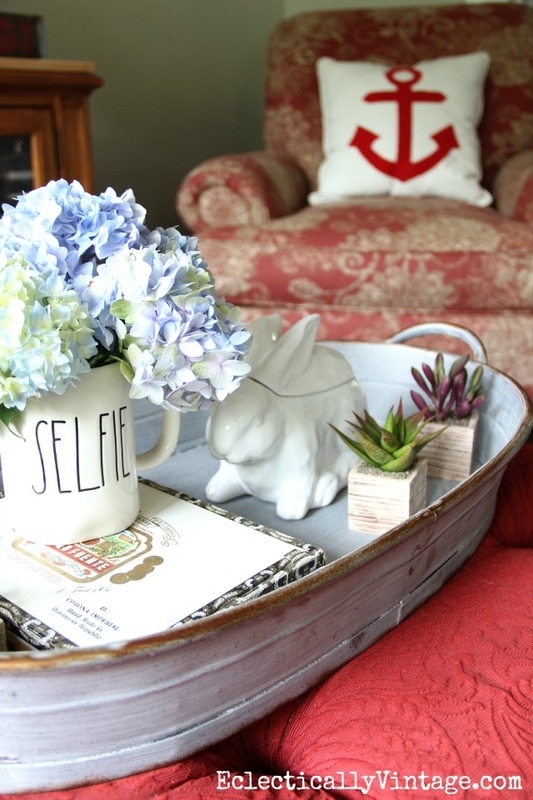 I can’t get enough of hydrangeas straight from my yard and they look even better in a selfie mug from HomeGoods. 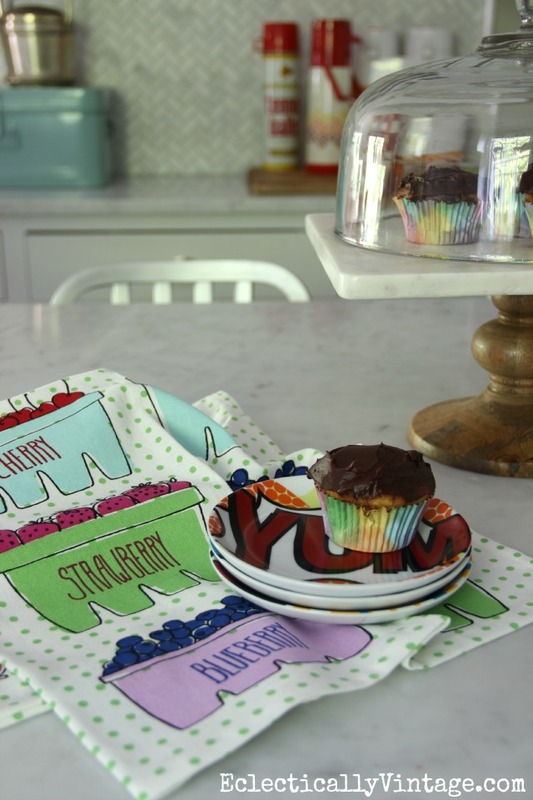 I have a small tray obsession – perfect on an ottoman. 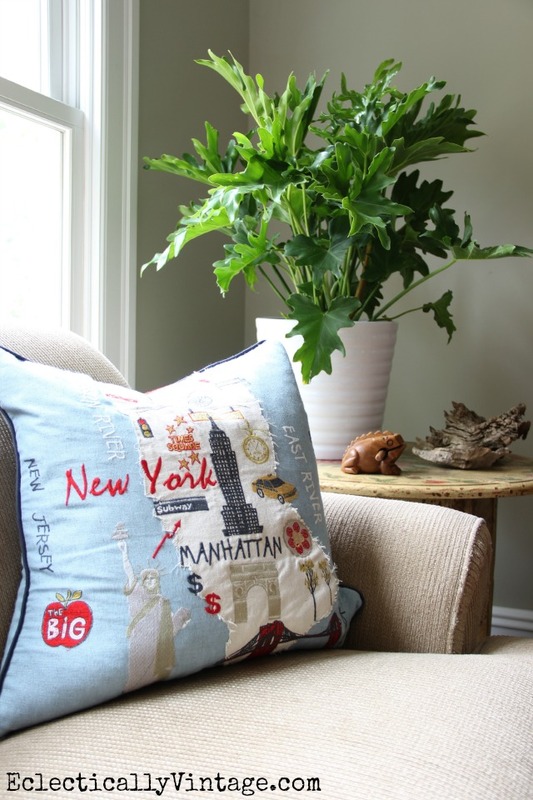 I also have a pillow addiction and always find the best selection like these from HomeGoods. I went a little crazy at Ikea and love the way this philodendron brings life to a corner of my family room. Let’s talk about the elephant in the room. 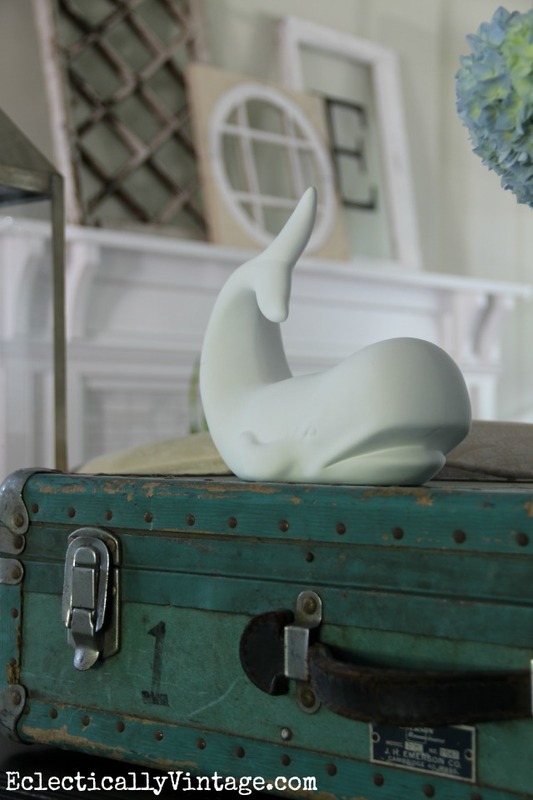 That cute little white elephant from HomeGoods holds our phones while they charge. Last year, I trained ivy around this orb I got from HomeGoods. 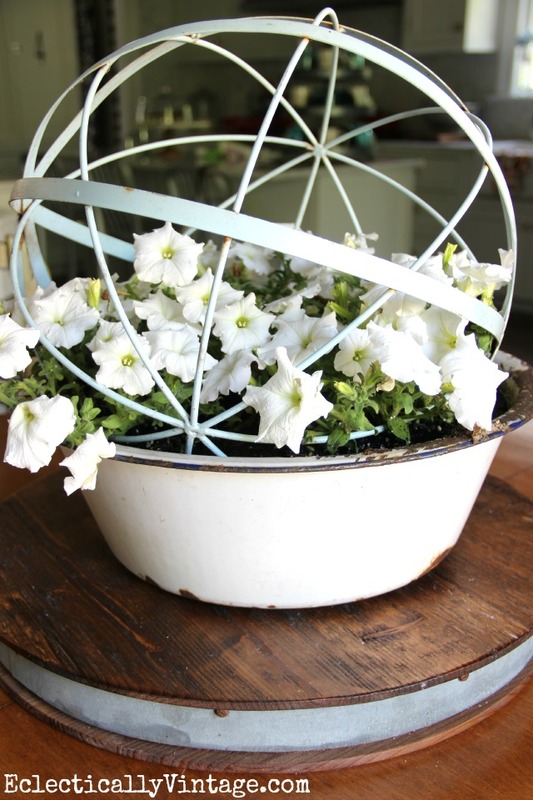 This year, it’s petunias in a vintage enamel bowl. 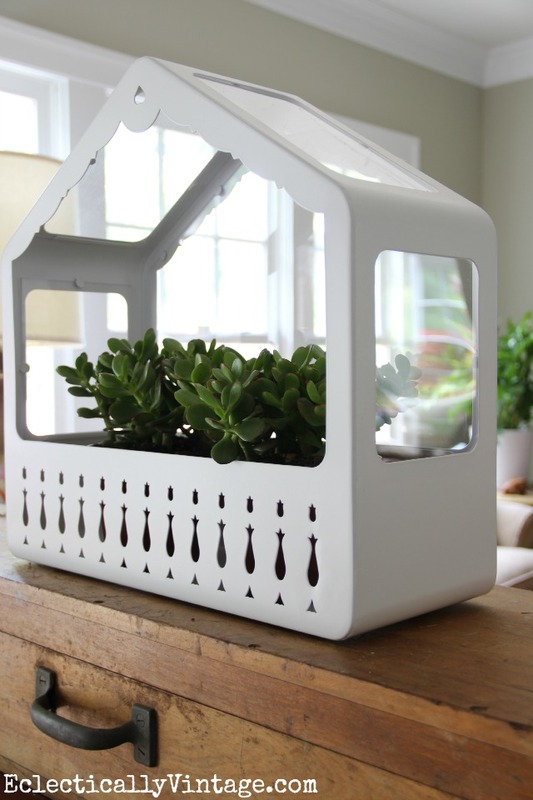 Another Ikea find – how cute is this little terrarium. 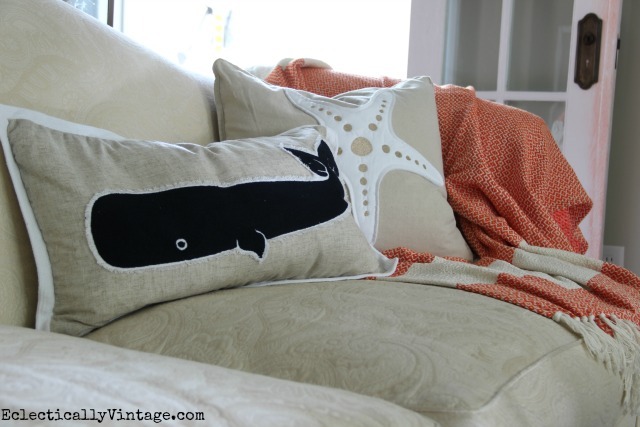 A peek into my family room from the living room. 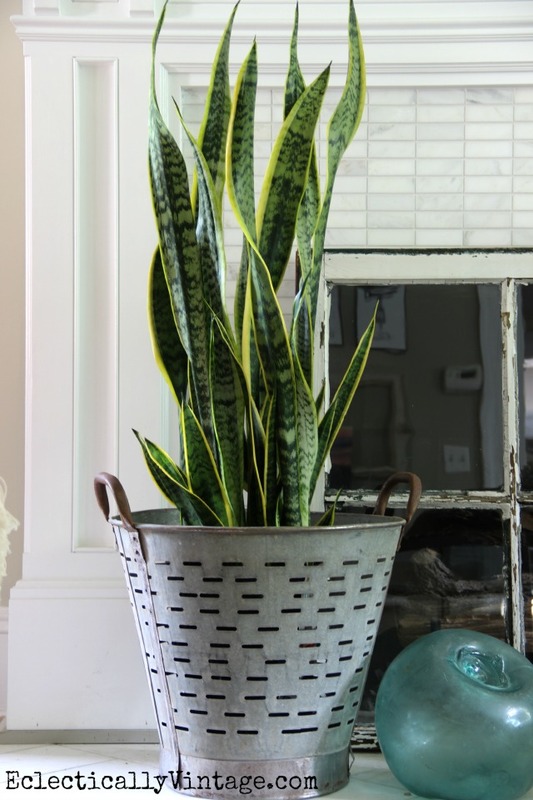 Did you know that another name for a snake plant is mother-in-law’s tongue? 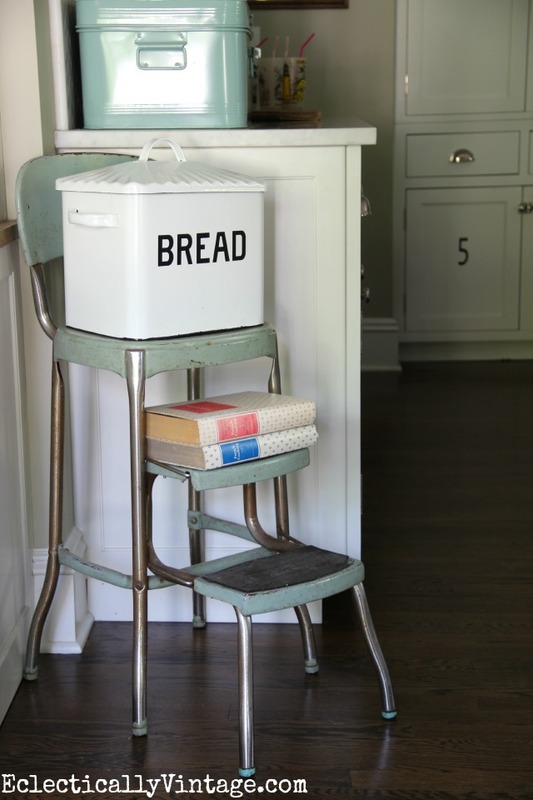 I love the way they look in my vintage olive buckets (along with this gorgeous dough bowl). 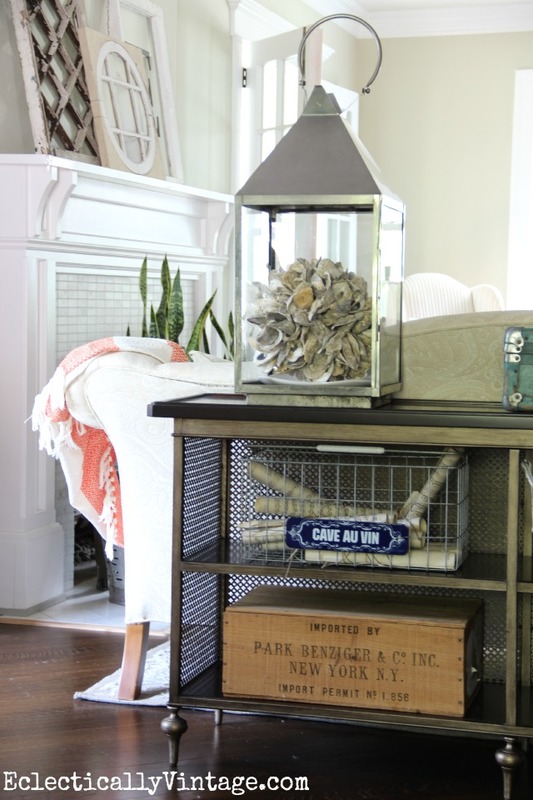 I love everything about my console table that reminds me of a vintage radiator screen. 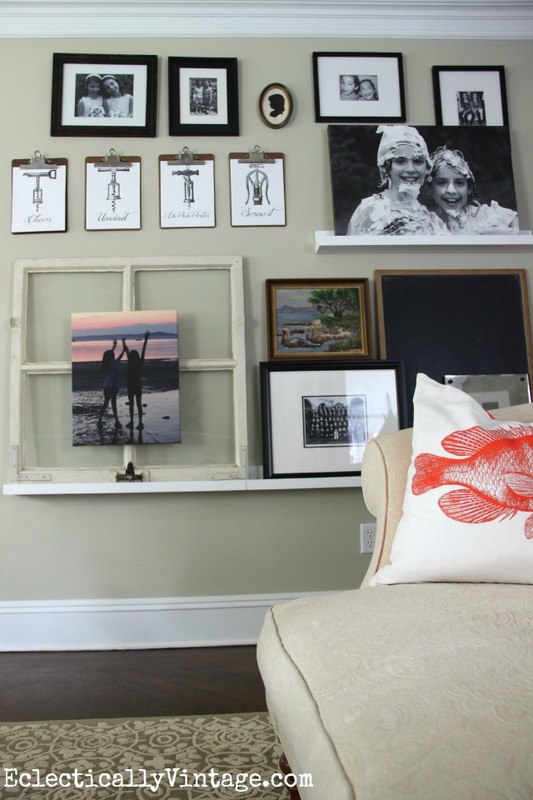 Picture ledges make it easy for me to change out art and photos. 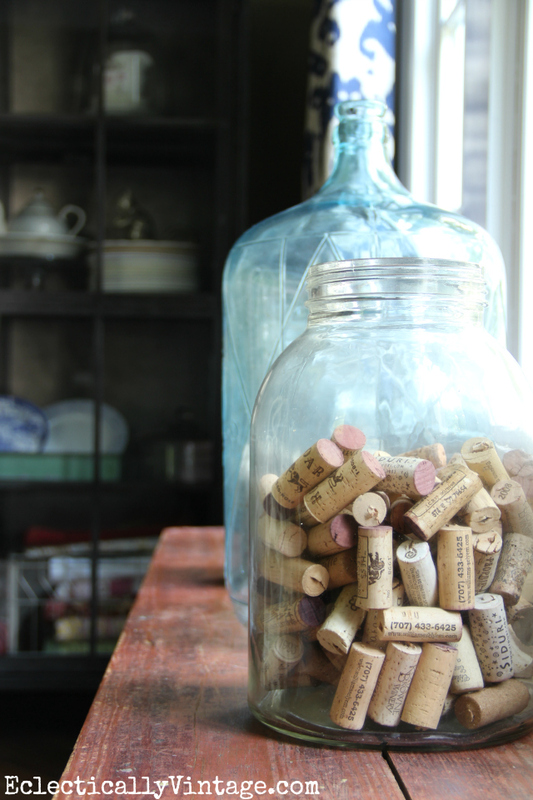 Print FREE corkscrew printables for your favorite wine lover. 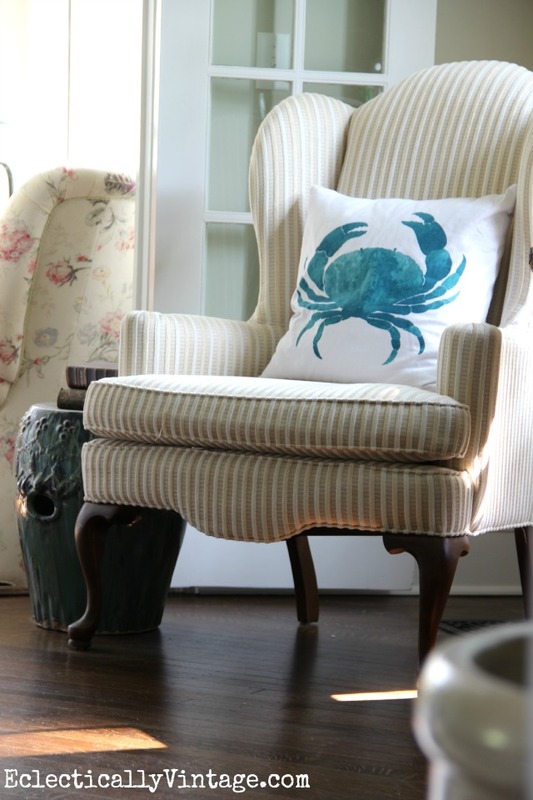 The crabby corner – I can’t get enough pillows and these were all found at HomeGoods. I’ve been working on my dining room making changes slowly but surely and I’m loving how it looks right now. 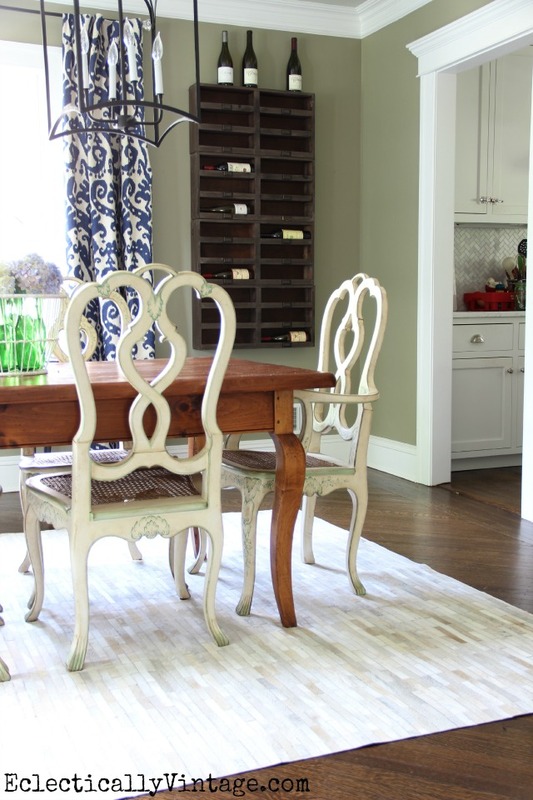 You can see much more of my dining room here. 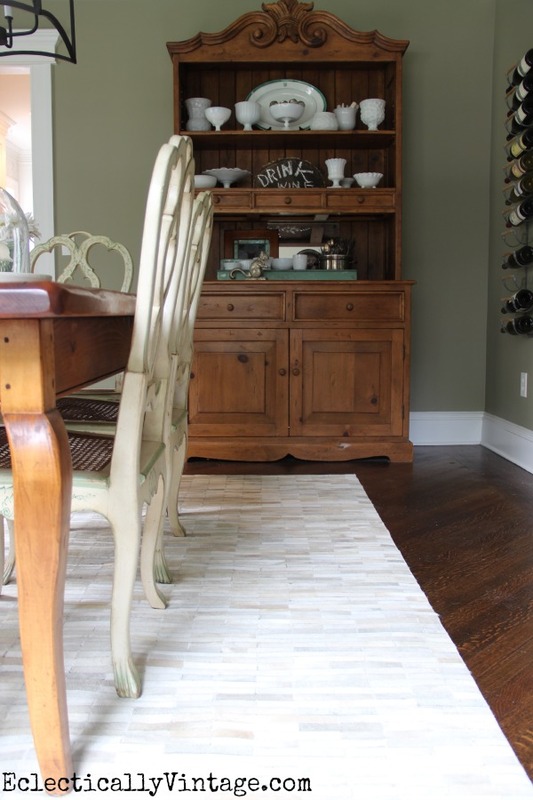 My pieced cowhide rug is from RugsUSA. 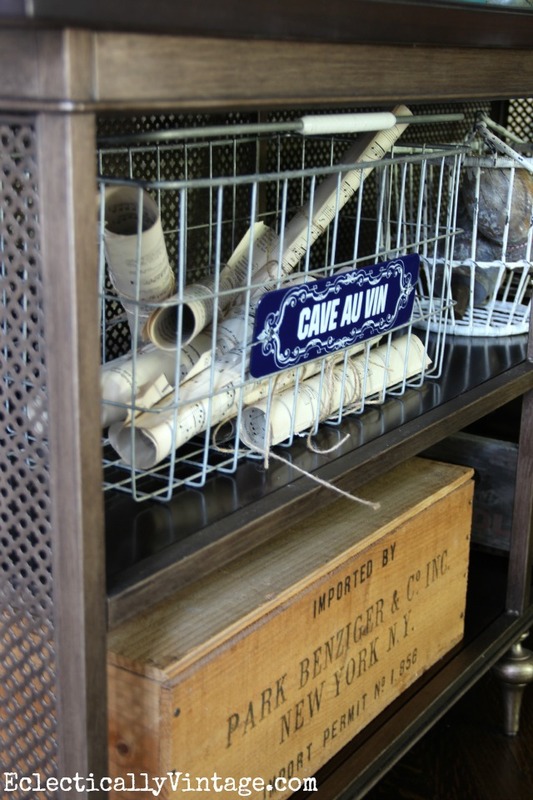 and these wine cubbies from Mothology. 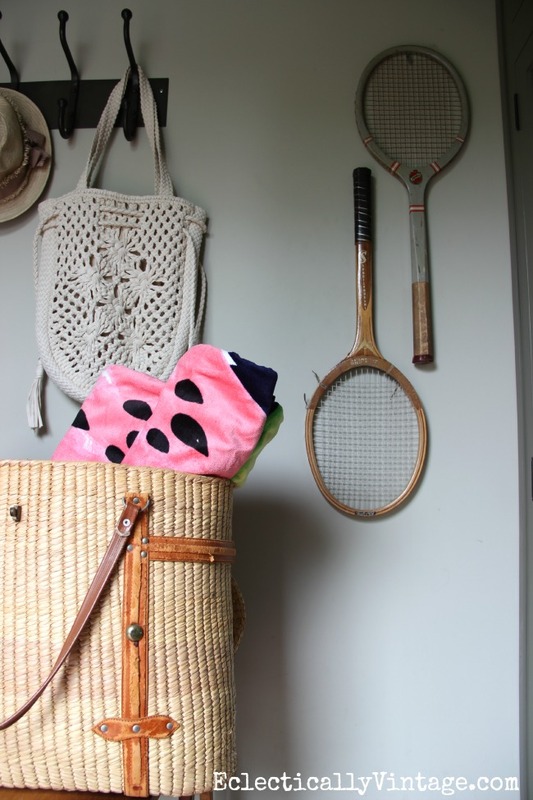 My attic guest room is so cozy – I love to escape up there! Everyone needs pink flamingo sheets. 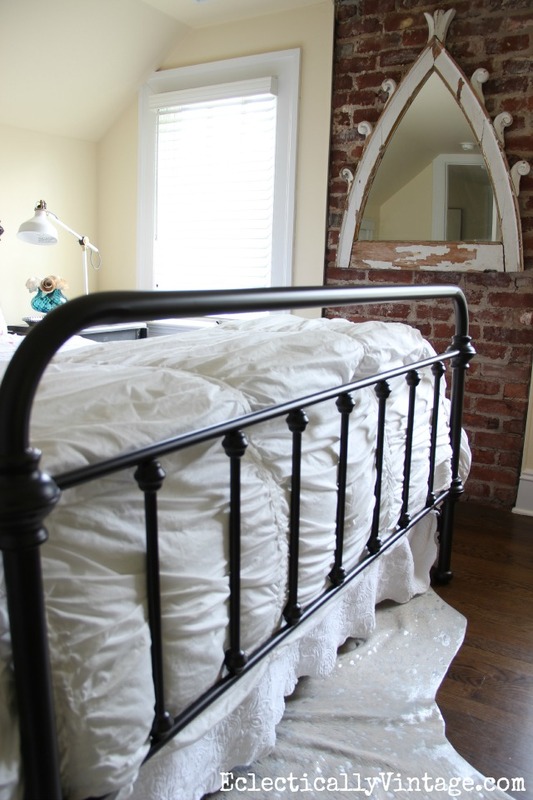 Love the vintage feel of this iron bed. I found the perfect pair of lamps at Ikea. I found this old sign at a wild blueberry stand in Maine for $10! 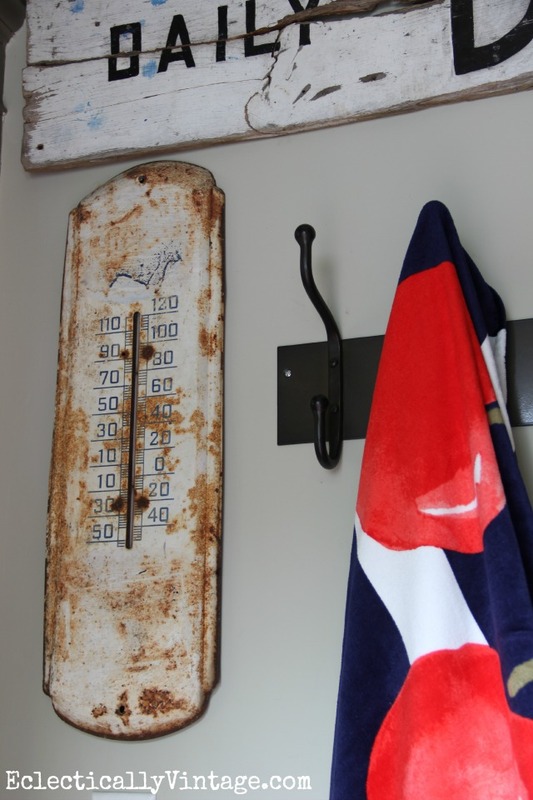 Another estate sale find with perfectly distressed leather handles holds favorite beach towels. It’s been raining cats and dogs here (I left my car windows open during a torrential downpour and both the car and I got soaked) so I don’t have any pics to share of my yard yet but here’s my porch (see more of my porch, including my fun buoy lights, here). Don’t forget to download bHome (the app) on your iPhone for free – you can follow my blog (and what I’m pinning, sharing on Facebook and Instgram all in one place) plus you’ll find other amazing bloggers to follow too. 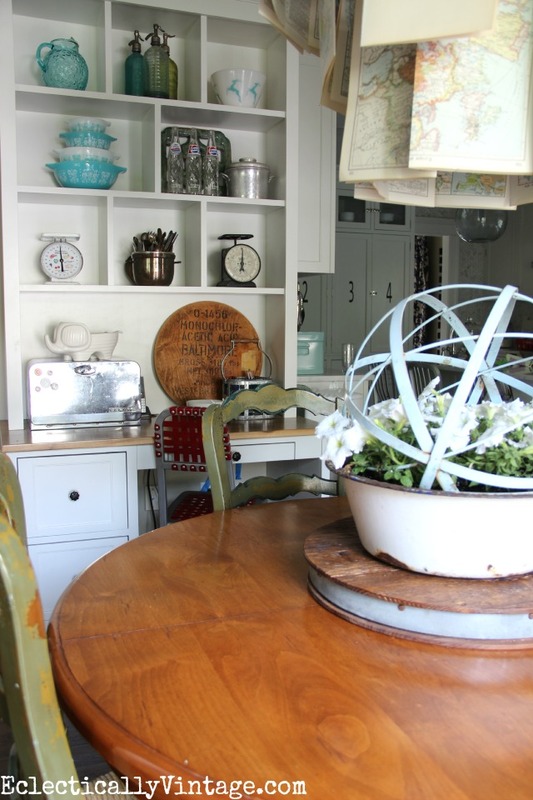 « Previous: Vintage Olive Buckets and Dough Bowls, Oh My! Kelly… your house always makes me happy! 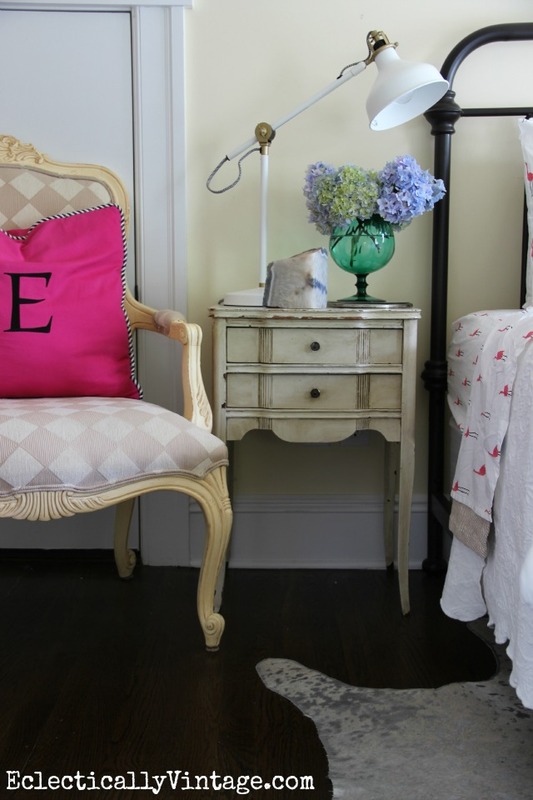 I just love how fun, energetic and perfectly layered with charm it is!! your place is the funniest house on the block…even without the vodka in the lemonade. seriously, love all your fun details. happy summer! But even better with the vodka! 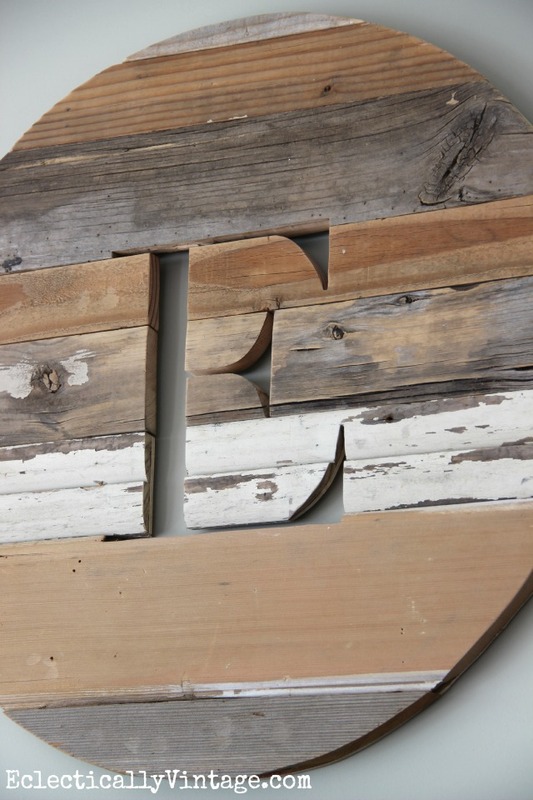 love the Monograms on reclaimed wood. What really caught my eye was the music notes and words to” you are my sunshine”Thats the song I sing to my senior adopted horses every morning when I feed them. I lost my 25 year old American Paint Mare on May29 unexpectedly. I love her so much, it broke my heart ..Her 2 pasture mates are still sad to, but I continue to sing to them so we feel better.I adopted them from a rescue 4 yearsago and they changed my lifeforever. They were neglected ,abused and malnourished. I was determind to make whatever time they have left filled with love,good food and hay and kindness and trust. I have a special place in my tack room I could put the song if I win, right over the little door that opens into their stalls so I can see them and give them a sweet treat. Your horses are lucky to have you Carolyn! So sorry that you lost your mare. Keep on singing. 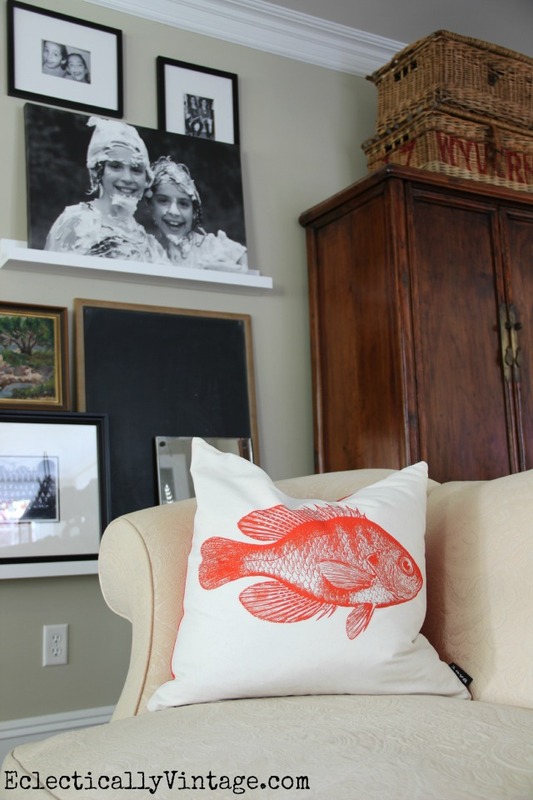 Oh Kelly what can I say other than your home tour is eye candy for the soul….your interiors are fun, just like you. 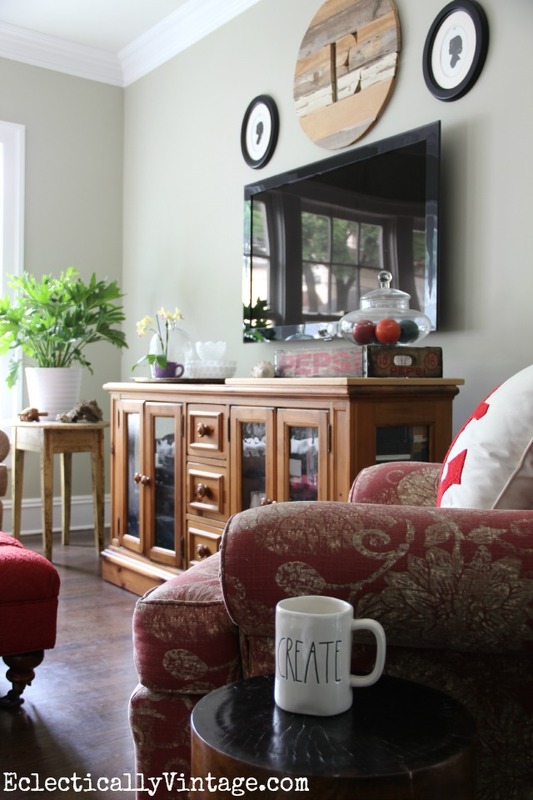 Love it when someone decorates and fills their home with the things they love and create spaces that are a true showstopper. I feel as though your home is like Happy Hour all day long. Enjoyed your Summer Home! Stop by for happy hour specials any time Shirley! 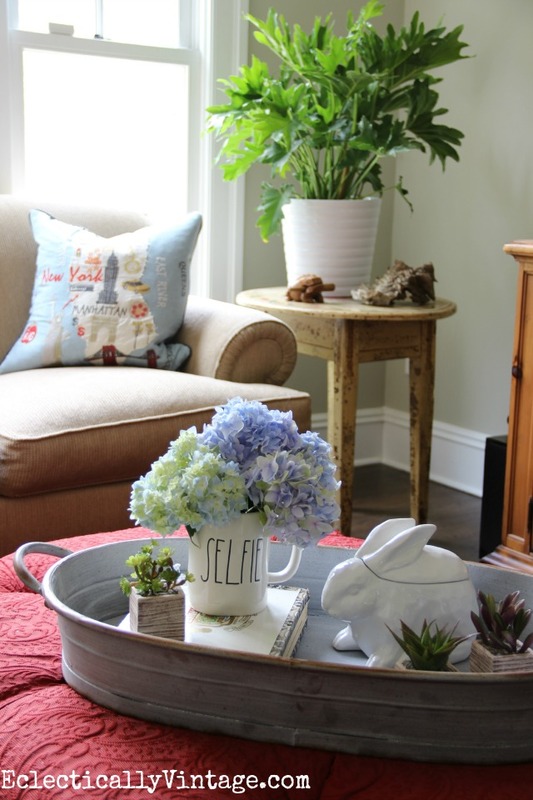 What a fantastic home tour! 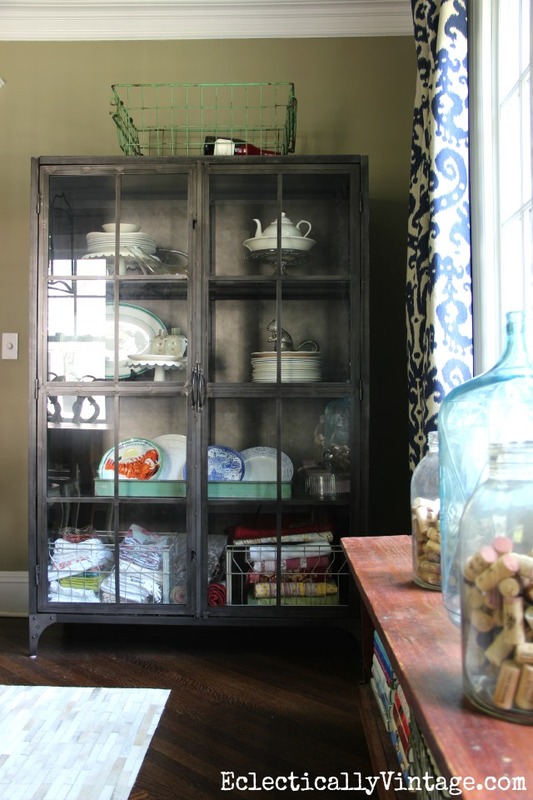 You have so many beautiful treasures and you have displayed them so beautifully around your home — LOVE it all! Thanks Julie & have a wonderful summer! I found your site by the summer tour. Your house is beautiful! 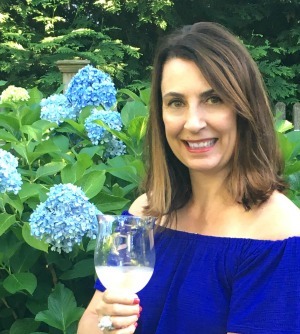 Thanks Jeanne – happy summer! You’re welcome for a cocktail anytime Kerryanne! Have you tried putting those state glasses in the dishwasher? I’m wondering if they will survive in there. 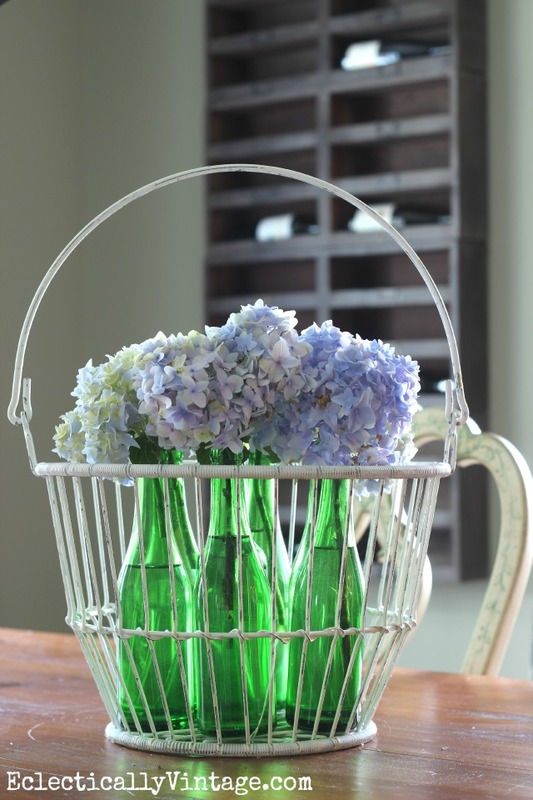 I never put my vintage glasses in the dishwasher – unfortunately, I have to hand wash them but it’s worth it! I have a couple of printed on glasses (a pirate scene and a circus scene) that I will put in the DW but they aren’t frosted. I don’t know if a frosted glass would survive. Hey, Kelly, your house always looks great! 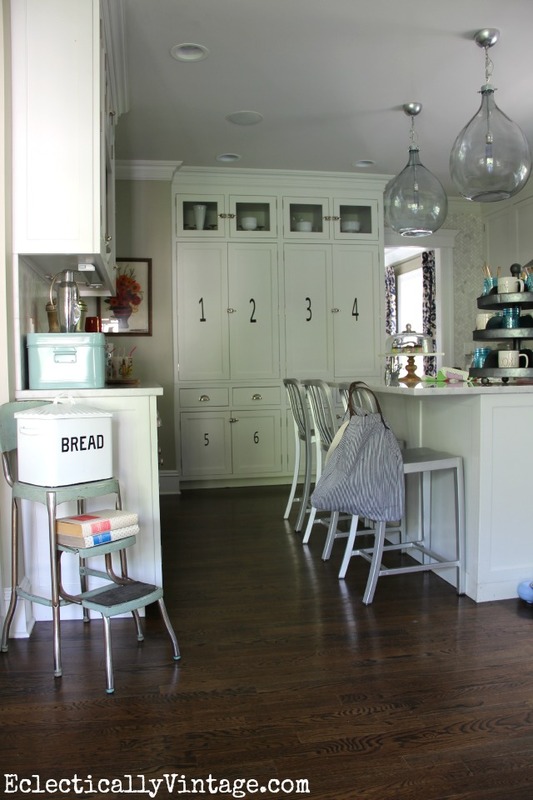 I think I love your kitchen the best, well except for your front porch, which I blatantly copied on my house. You do such a great job displaying your treasures. Enjoy the summer with your girls!! 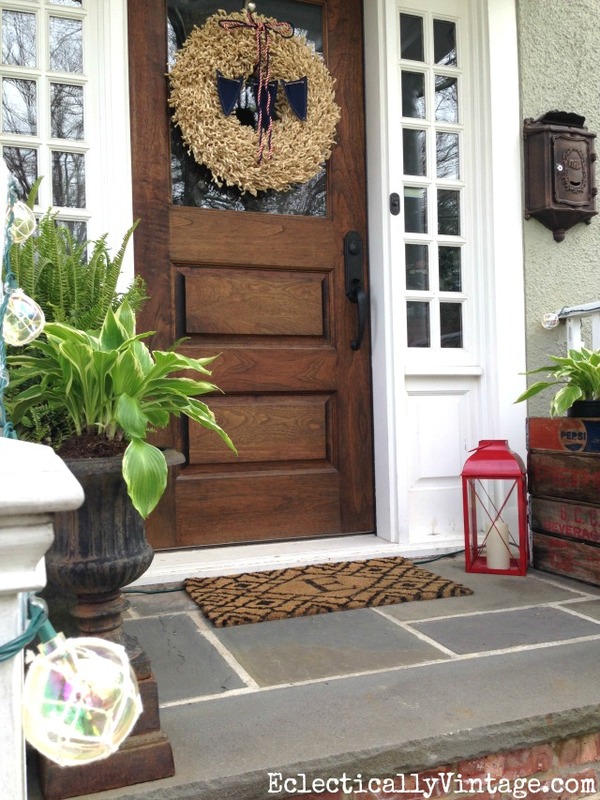 Copy away Rhoda and enjoy that beautiful porch (and great new patio)! 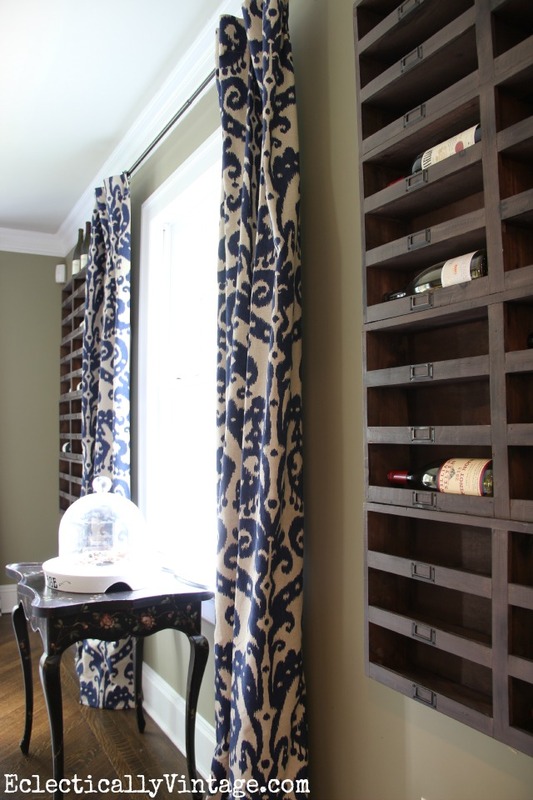 Can you tell me what the boxes are in the dining room that hold the wine, I am loving those. Love bHome, my name is broadwde. 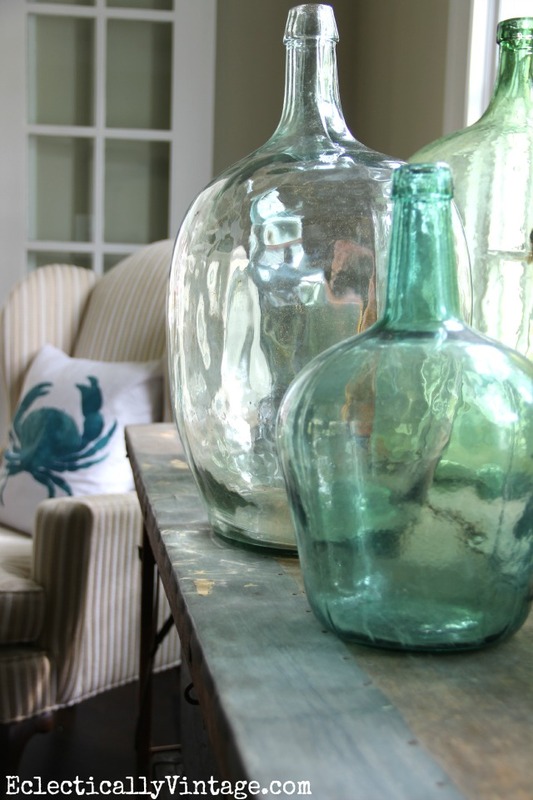 Your style is one of a kind and your home reflects that…what an amazing tour! 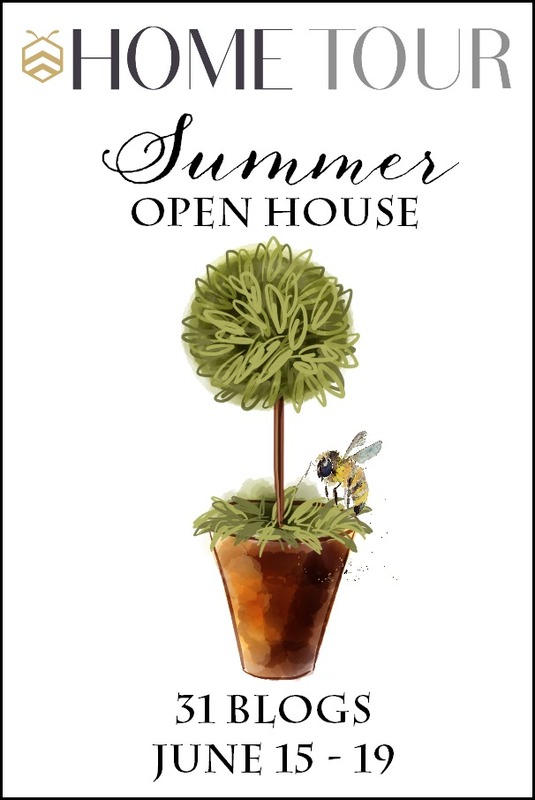 Thank you for joining our Open House…relax and enjoy the rest of the summer! 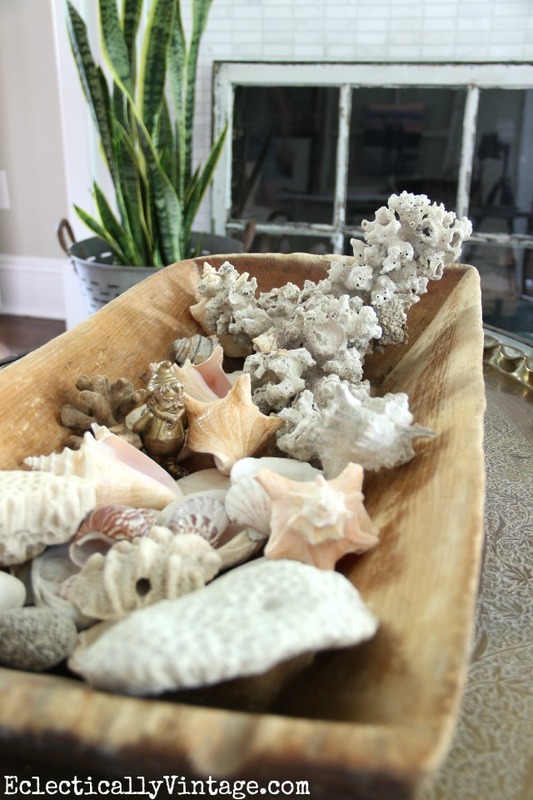 Thanks Ann – love being in such great company with all of these amazing home tours! 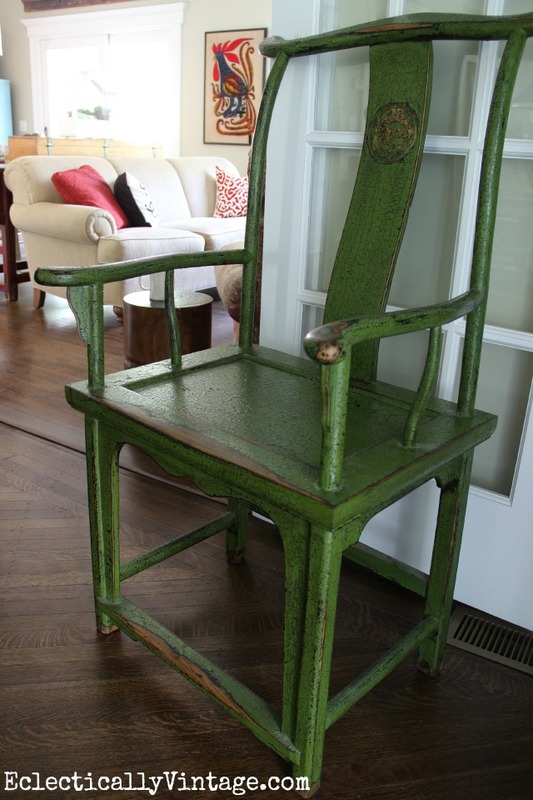 Thanks Deb – keep on searching and a treasure will fall right into your lap! Kelly, it’s always a treat to tour your old home that you have lovingly decorated. 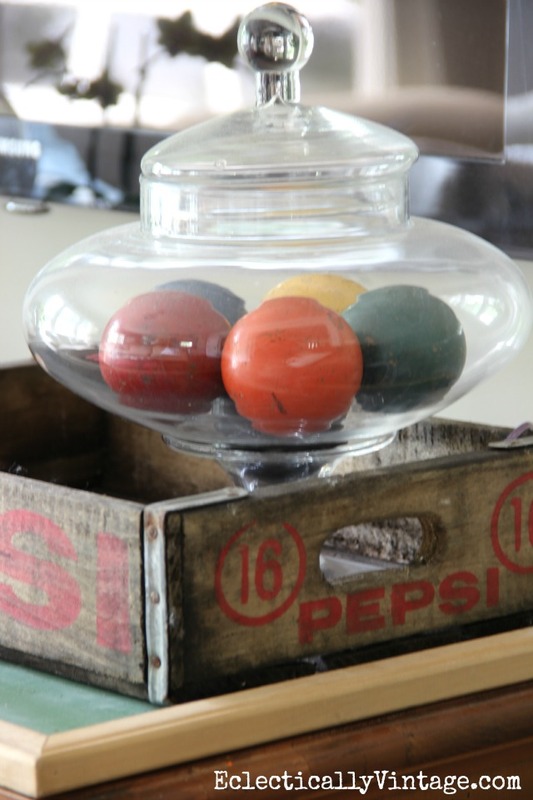 You are the best at incorporating vintage finds into your decor. 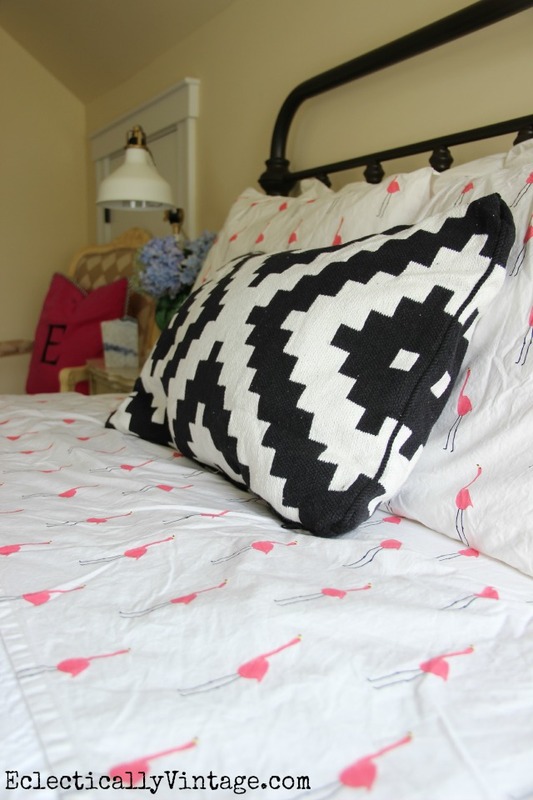 Those flamingo sheets are just too darn cute! 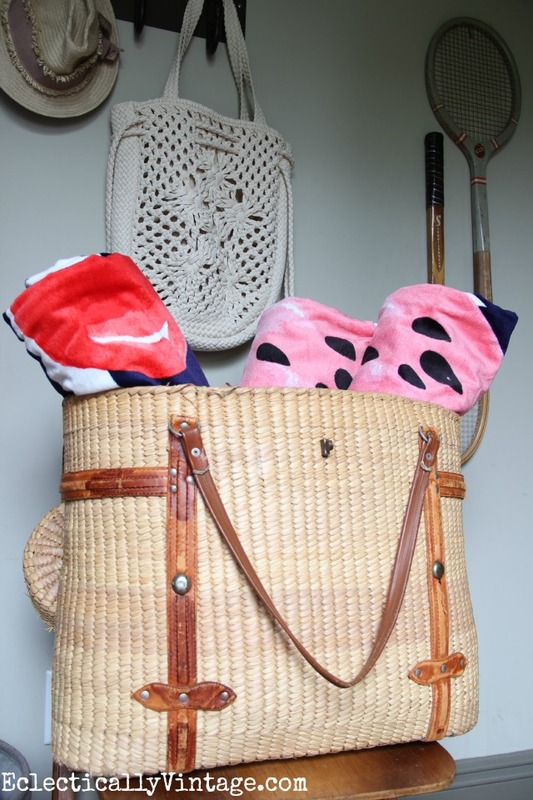 Thanks Kim – flamingos make everything better! Kelly your home from top to bottom is truly unique and such a reflection of you and your family. There is so much to look at and enjoy and I am sure everything has a story. That’s what I love! I enjoyed your tour so much. Thanks Debbie – hope you have an amazing summer! 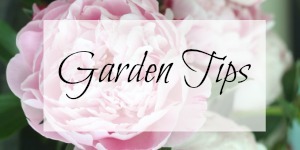 Glad you popped over to my blog Leann – thank so much and I’m thrilled I could inspire you! Thank you so much Wendy – happy summer! Love it all! 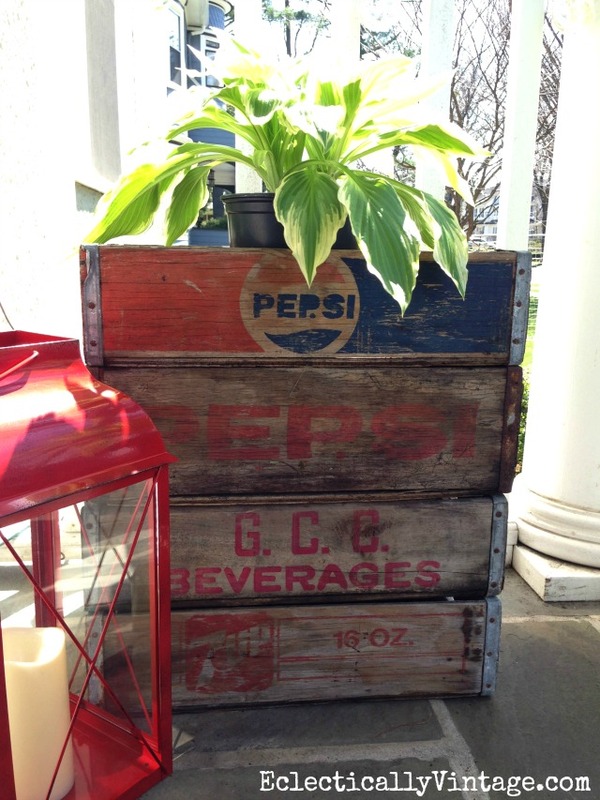 Especially the Pepsi crates and bottles w/flowers. 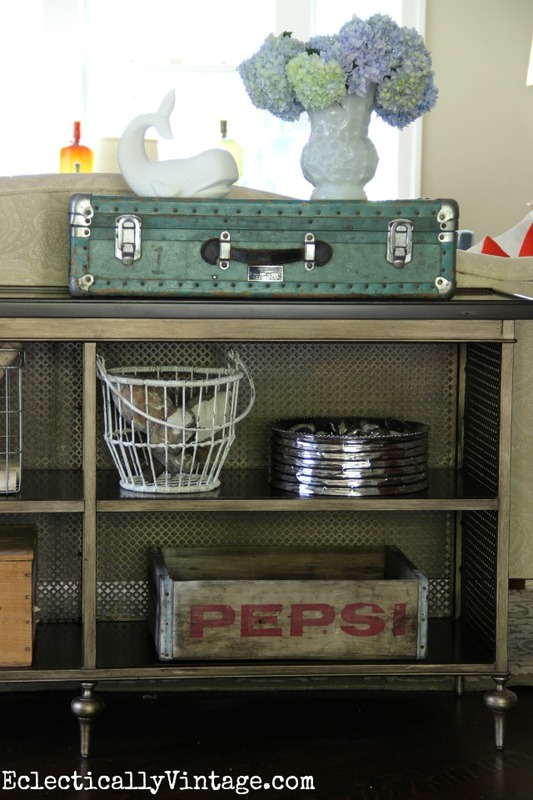 Thanks Debbie – can you believe I found those crates for free – they were burning them! Thanks Carmen – glad I can inspire you and hope you have a very happy summer! The past means a lot to you. 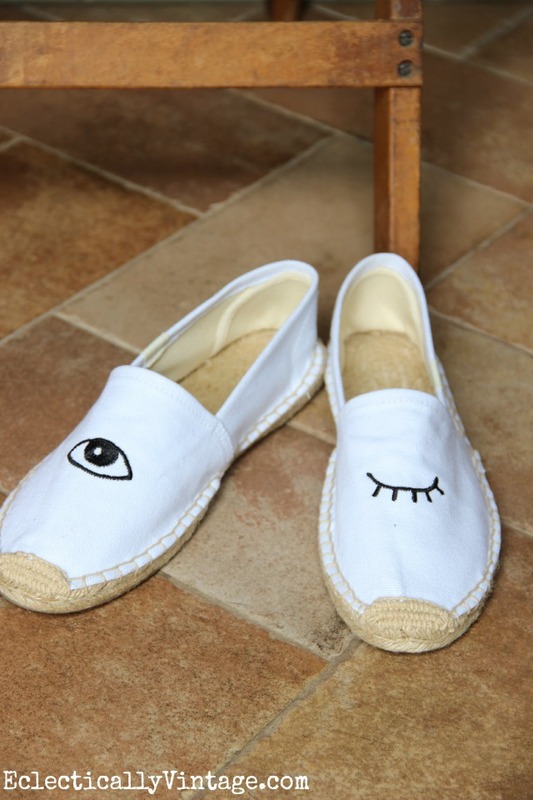 You embrace control and order but secretly you are a hippy at heart. You have a multifaceted personality that – under the stricter appearance – is anything but boring. You are also very, very playful. You got me – except for the order part. My house is usually in chaos but isn’t that the sign of a creative mind?! Last, I’m guessing you’re from the Cape Cod/Nantucket area? I see a lot of influences from there, and am guessing. We just came back from a vacation there yesterday. I still have Newport Beach sand in my shoes, and a stack of shells picked up on the Cape Cod seaway. 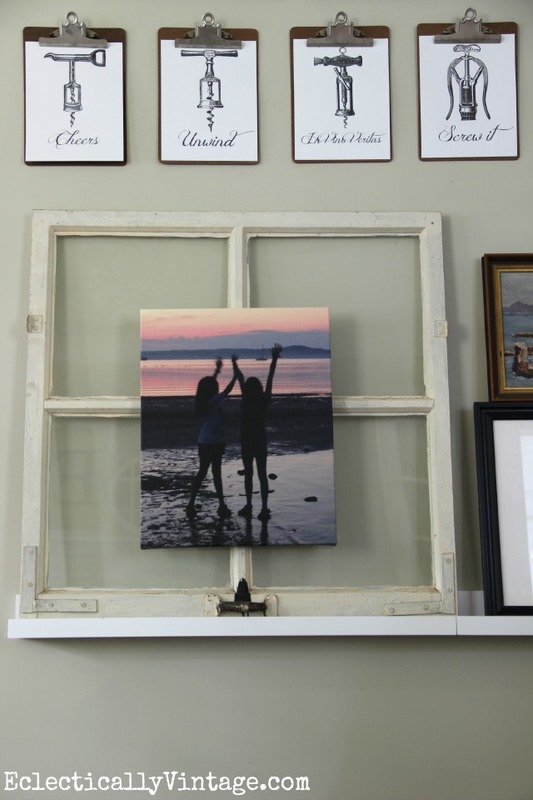 It was my favorite part of our entire New England vacation – such a great place to unwind!! Thanks Jennifer! 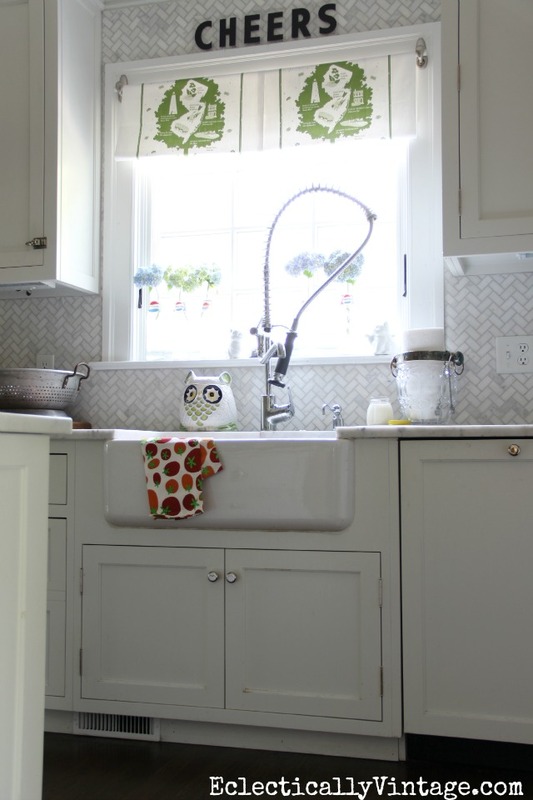 The dish towel is from HomeGoods and so is the aqua box on my kitchen counter. I’m actually from NJ – a friend gave me those vintage state glasses. I did take a vacation last summer in Cape Cod and loved it and I love Newport too! I need to go back soon! Thanks for the info! I might need to make the drive to Home Goods again!! I absolutely love your home! 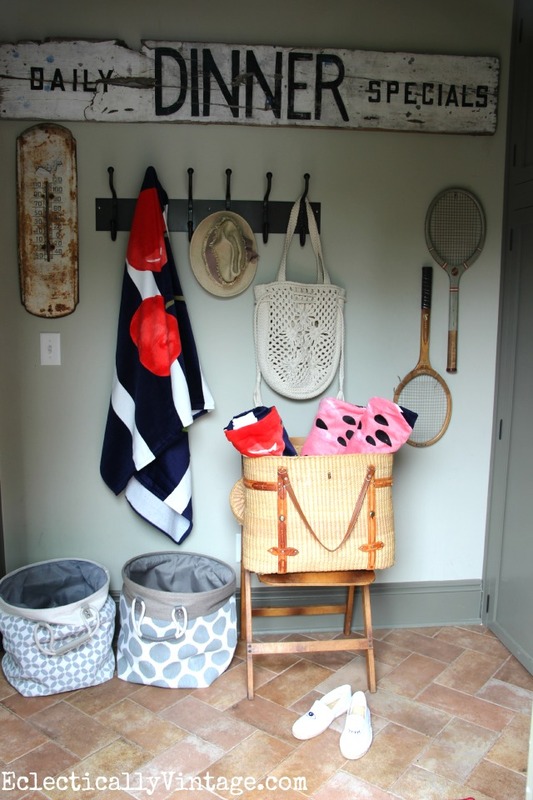 It just is so creative and inviting and I just love how you’ve used so many vintage things. Unfortunately bHome isn’t available for android yet so I don’t have a user name — I hope that doesn’t exclude me from the give-away! It’s coming Mary so stay tuned. I think there will be another giveaway when Android is available. Thank you Mary and enjoy your summer! 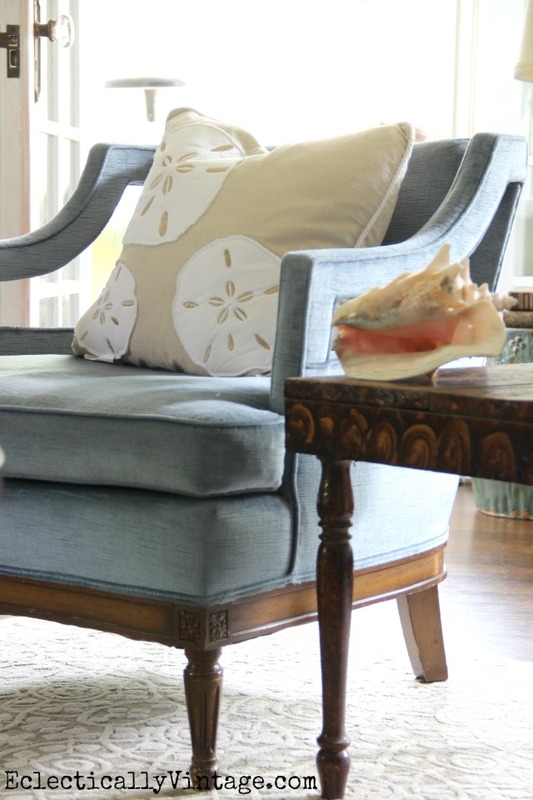 I love your style,you have a wonderfully warm inviting home and that is exactly your personality. Enjoyed your new house tour; always like to see what you are up to. 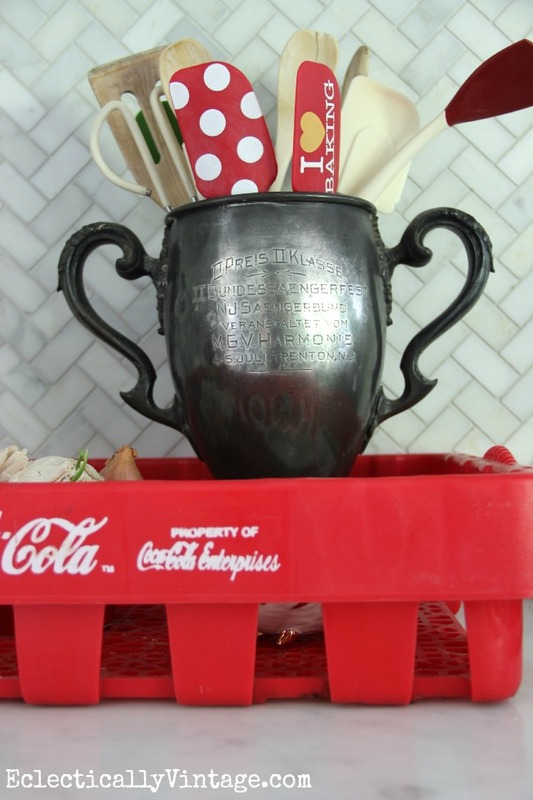 Especially interested in the love cup utensils holder on your stove…does it say Trenton,NJ? Good eyes Renee! I went to college at Rider in Lawrenceille! 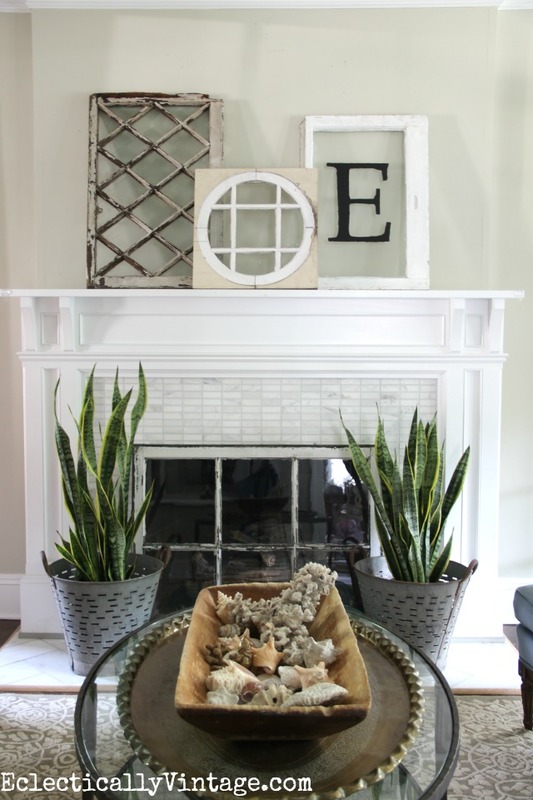 Wow, you have so many awesome accessories and such creative ways to display them 🙂 Love the hydrangeas and the wood monogram and the white ceramic whale. But the one piece I love most of all is your gorgeous blue float! It still makes me sad that I missed out on the two big floats I wanted to buy in South Carolina, but the stupid store never opened! Kelly, your home is as unique as you! 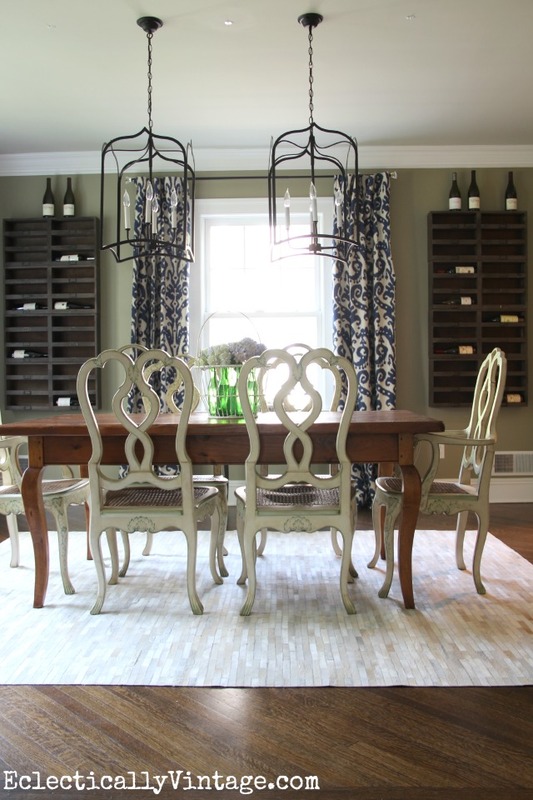 I love your eclectic, fun style, and I am crushing on those wine cubbies in your dining room. What a great addition! And did i spy some little Boston bull terrier salt and pepper shakers in your kitchen??? Thanks Kelly – fun being part of the bHome summer tour! 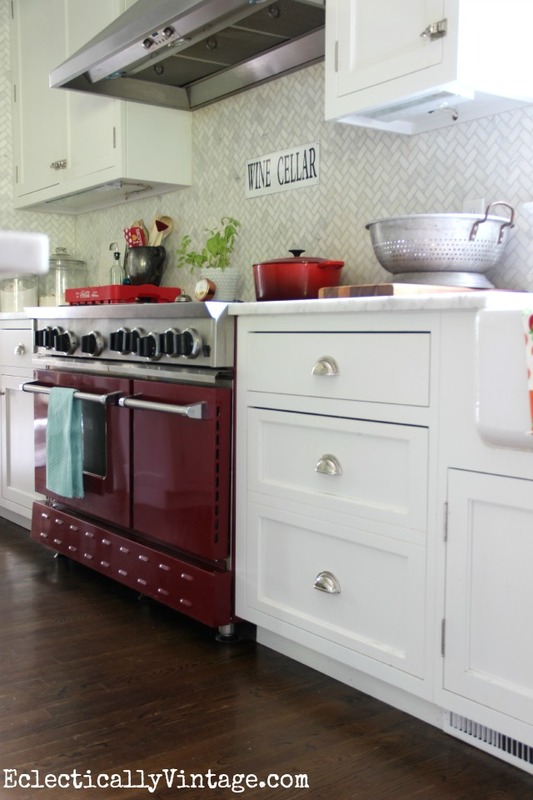 It’s an amazing home tour! So full of vintage treasures 🙂 LOVE!!! Kelly everything looks absolutely beautiful!!! And that attic room? AMAZING!! Thank You! 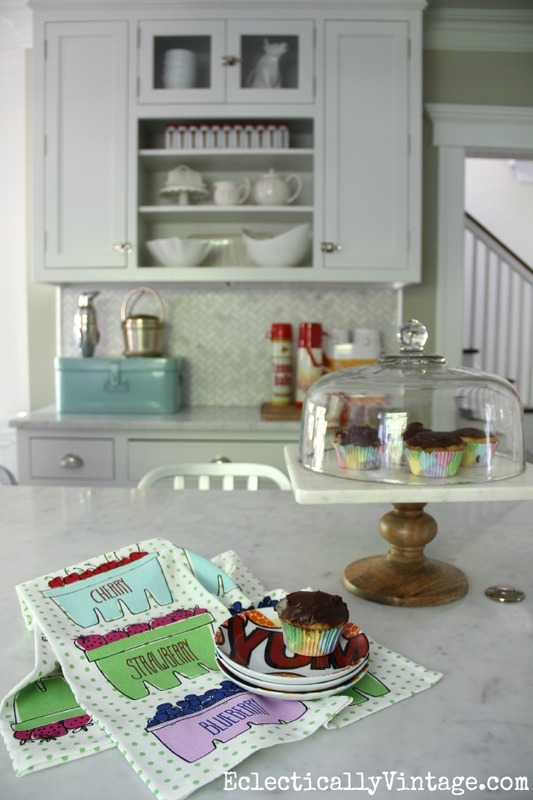 Your house is so fun to see… Love your style! My username is deedlegirl20. Thanks for tour! Made my morning! Inspiring, full of surprises and feels like a lot of love spread everywhere! Love the photo of the girls with foam…such a great capture! Thanks Taylor! The girls had a shaving cream fight at camp and it’s one of my favorite pics of them! I always love to see your house. Especially that kitchen!! Glad you enjoyed it Caroline! Your home is fabulous! And that kitchen!? Wow! Don’t get me started. So happy to be on this tour with you!! My bhome user name is AuntieLa. Thanks! 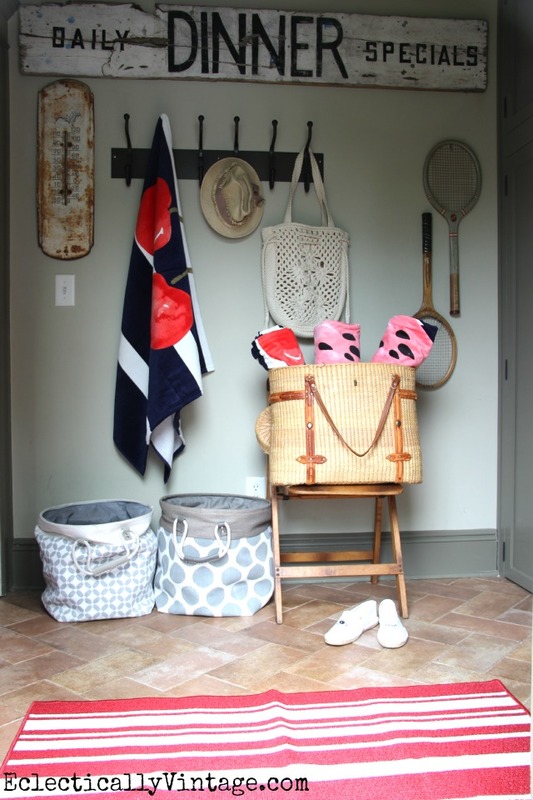 Your summer home tour is just beautiful! Every detail is perfection. 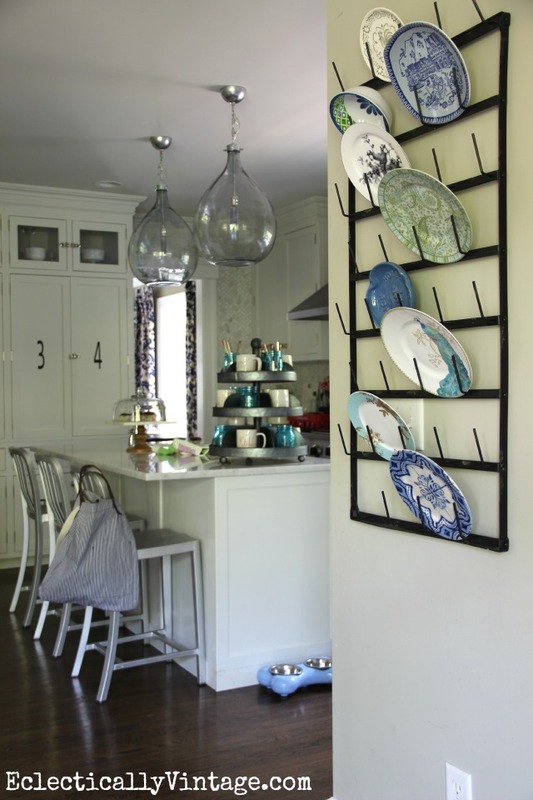 I love the drying rack in your dining room! The link doesn’t work and I was really wanting to know where you got it. Thanks! EEEKK!! Oh, how I love your style, Kelly. You make vintage so chic. Sorry it took me so long to get ‘here’ ~ I think it would have been faster if I had walked. I hope you’re having a wonderful summer ~ I’m so happy to have been a part of this bHome tour with you. 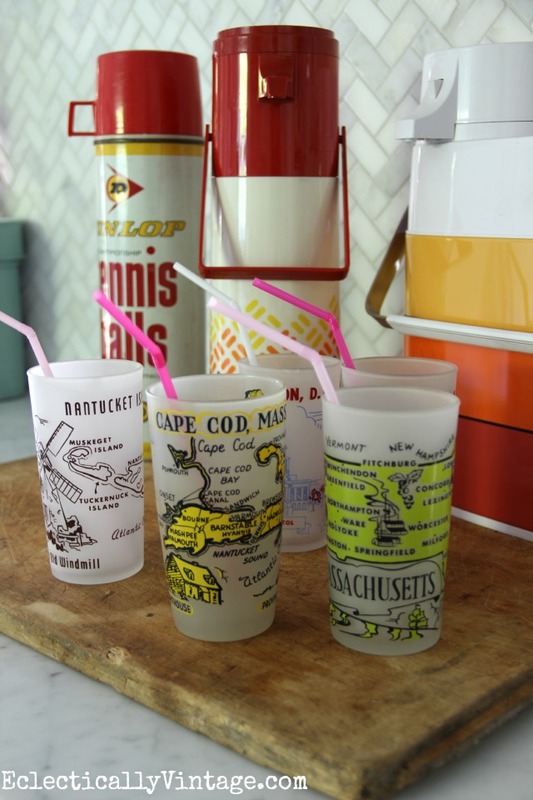 I am totally drooling over your vintage state glasses! I have lived my whole life in MA and would LOVE to score those glasses! Beautiful pics! I love everything! Love all of your pictures, Kelly. Can you give me some information about the red and khaki chair shown in the picture with the white tub tray? Thanks you! Is that the original fabric? 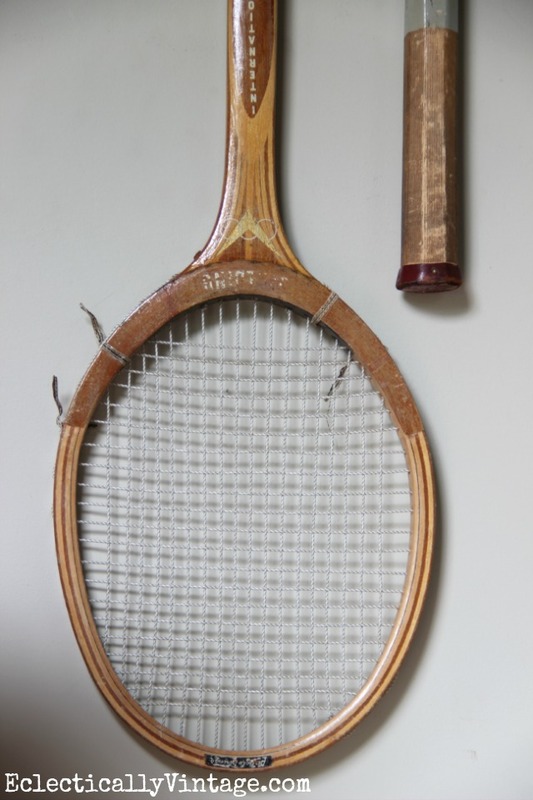 If you have had them recovered, do you know what the fabric is? I love it!! 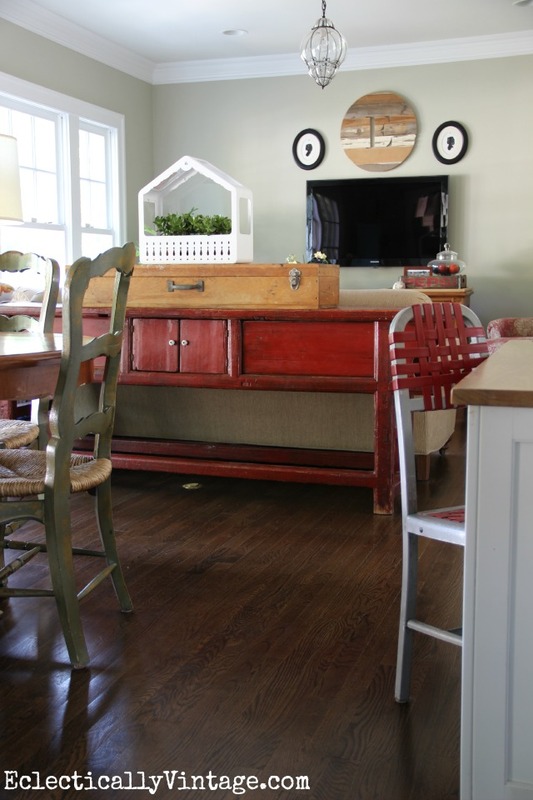 The red and khaki fabric on the chair in the picture with the white tub tray. Thanks! Where did you get the hanging pendant kitchen lights?? 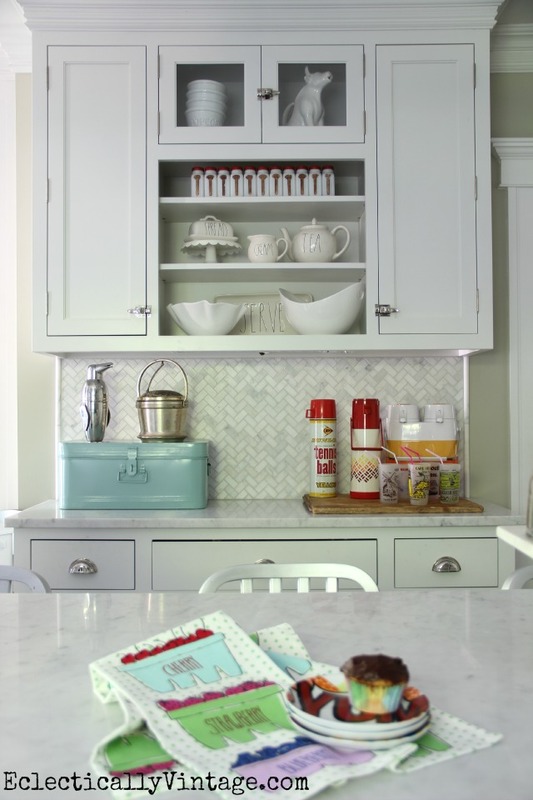 Do you have any links or information to share on the herringbone tile backslash? 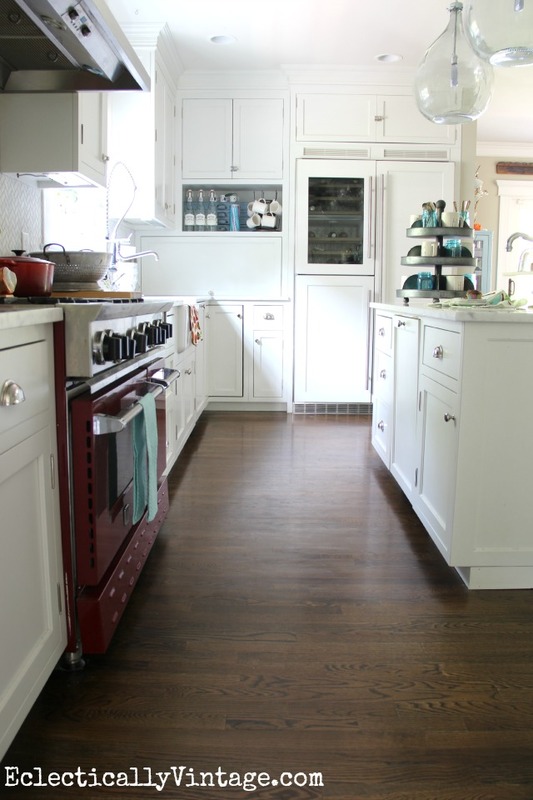 Love your home, and the kitchen is my favorite by the way. So beautiful. Especially the triple decker industrial circle display on the counter. Where can that be ordered? 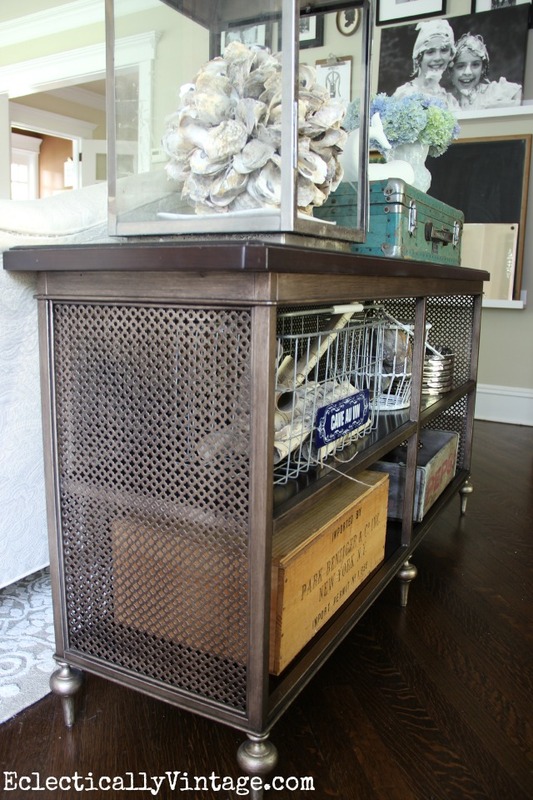 Where can I purchase the three tier metal caddy?